Monday, January 19, 1835.Vandalia, IL. Lincoln votes against amendment to female academy incorporation bill which would bind property of trustees on payment of contracts. He then votes with majority to pass act.House Journal. Tuesday, January 19, 1836-Wednesday, January 20, 1836. Tuesday, January 19, 1836-Wednesday, January 20, 1836.En route to New Salem, IL. Saturday, January 19, 1839.Vandalia, IL. Tuesday, January 19, 1841.Springfield, IL. Lincoln attends legislature for at least part of day, but he "is reduced and emaciated in appearance and seems scarcely to possess strength enough to speak above a whisper. His case at present is truly deplorable but what prospect there may be for ultimate relief I cannot pretend to say." Carl Sandburg and Paul M. Angle, Mary Lincoln, 179. Friday, January 19, 1844.Springfield, IL. Argument begun yesterday in England v. Clark is continued by Edwards and Bledsoe for defendant and concluded by Lincoln for plaintiff. (On February 8, 1844, judgment of lower court is affirmed. )Record; 5 Ill. 486. Monday, January 19, 1846.Springfield, IL. Lincoln writes Hardin refusing to accept Hardin's new plan for selecting Whig candidate for Congress, and gives his reasons. "I am entirely satisfied with the old system." He promises to "keep cool." On Lincoln's motion, Supreme Court reinstates Curyea et al. v. Hayward.Abraham Lincoln to John J. Hardin, 19 January 1846, CW, 1:356-58; Record. Wednesday, January 19, 1848.Washington, DC. From Committee on Post Office and Post Roads Lincoln reports bill for relief of William Fuller and Orlando Saltmarsh.Globe; Report in United States House of Representatives Concerning Petition of William Fuller and Orlando Saltmarsh, 19 January 1848, CW, 1:442-44. He writes to Herndon regarding case in Christian County, and to J. R. Diller, postmaster at Springfield, promising that he will do what he can to have his allowance for clerk hire and other expenses increased.Abraham Lincoln to William H. Herndon, 19 January 1848, CW, 1:445; Abraham Lincoln to Jonathan R. Diller, 19 January 1848, CW, 1:444-45. Friday, January 19, 1849.Washington, DC. Lincoln votes against reconsideration of bill granting compensation for slave sent west with Indians. He votes against passage, but it passes 101-95. Globe. To J. B. Herrick, who has recommended William M. Black for register of Land Office at Vandalia, Lincoln writes: "I shall, when the time comes, try to do right, in view of all the lights then before me." Abraham Lincoln to Josiah B. Herrick, 19 January 1849, CW, 2:23-24. Saturday, January 19, 1850.Springfield, IL. Supreme Court hands down opinions. In Adams et al. v. Logan County, Illinois, decision of Circuit Court is upheld, declaring conveyance of land to county in consideration of location of county seat does not deprive legislature of right of removal. In Austin v. People for use of Burr et al. judgment of Circuit Court is reversed and case is remanded. Webster & Huntington v. French et al. is also reversed and remanded. Record; 11 Ill., 254, 336, 452. Monday, January 19, 1852.Springfield, IL. Lincoln wins his appeal in Dorman et ux. v. Yost when Supreme Court reverses decision of Circuit Court. Record; 13 Ill. 127-31. Orville H. Browning of Quincy delivers lecture on "The Dignity of Labor" at Third Presbyterian Church. "After the lecture," he records in his Diary, "went to Mr. Lincoln's to supper." Wednesday, January 19, 1853.Springfield, IL. Lincoln writes and signs petition for Supreme Court review of Alton & Sangamon RR v. Carpenter. Herndon-Weik Collection, Library of Congress, Washington, DC. Monday, January 19, 1857.Springfield, IL. In case in which he wrote affidavit for Rowan January 14, 1857, Lincoln himself makes affidavit that he has no knowledge of bond for costs having been filedand that he has seen none in papers in case. Original owned by James A. Jones, Springfield, Ill.
Tuesday, January 19, 1858.Springfield, IL. Lincoln writes Joseph Gillespie to "come right up" about embarrassing case in Supreme Court—People ex rel. Lanphier & Walker v. Hatch. Case involved reapportionment act passed in 1857. Gov. Bissell had signed it inadvertently, then crossed off his name. Democrats bring suit to compel secretary of state to certify act. Case involves politics and Lincoln's senatorial ambitions, for reapportionment changed districts to Republican disadvantage. Lincoln also telegraphs George T. Brown, Alton Republican, to send Gillespie "at once. Don't fail[.]" Abraham Lincoln to Joseph Gillespie, 19 January 1858, CW, 2:432; Abraham Lincoln to George T. Brown, 19 January 1858, CW, 2:432; 19 Ill. 283. Lincoln & Herndon file bill in chancery in Sangamon Circuit Court in Doup v. Gibson et al.Photocopy. Wednesday, January 19, 1859.Springfield, IL. Lincoln, in Supreme Court, appears for Illinois Central in six suits in which railroad is defendant. All are continued (see January 14, 1860). Record. Thursday, January 19, 1860.Springfield, IL. 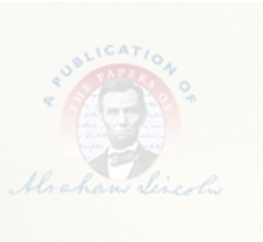 Lincoln files declaration in Piatt v. Wilson in U.S. Circuit Court. Defendant is charged with unlawful possession of land in Hamilton County. Hay and Cullom enter defendant's appearance, waive service of declaration and notice, and file plea of general issue, which Lincoln wrote. Files; Record. Saturday, January 19, 1861.Springfield, IL. In evening Cong. William Kellogg (Ill.), member of House Committee of Thirty-three, arrives in Springfield to confer with Lincoln. "His object is supposed to be in reference to a compromise of the national difficulties." N.Y. Tribune, 22 January 1861. Matias Romero, Mexican chargé d'Affaires in Washington, calls upon Lincoln at home. Ernest G. Hildner, Jr., "The Mexican Envoy Visits Lincoln," Abraham Lincoln Quarterly 6 (September 1950):184. Lincoln deposits $200 in Springfield Marine Bank and withdraws $31.25. Pratt, Personal Finances, 164, 175. Monday, January 19, 1863.Washington, DC. President replies to laudatory address from workingmen of Manchester, England: "It is now a pleasant duty to acknowledge the demonstration you have given of your desire that a spirit of peace and amity towards this country may prevail in the councils of your Queen." Abraham Lincoln to the Workingmen of Manchester, England, 19 January 1863, CW, 6:63-65. In afternoon J. E. Murdoch gives patriotic readings to select group at White House. In evening President and Mrs. Lincoln attend readings in Senate Chamber for benefit of sick and wounded soldiers. Murdoch reads "Sleeping Sentinel" by Francis De Haes Janvier. LL, No. 544; Daily National Republican (Washington, DC), 19 January 1863, 2d ed., 3:3, 20 January 1863, 2d ed., 2:1; Washington Chronicle, 20 January 1863. Tuesday, January 19, 1864.Washington, DC. President telegraphs Robert: "There is a good deal of smallpox here. Your friends must judge for themselves whether they ought to come or not." Abraham Lincoln to Robert T. Lincoln, 19 January 1864, CW, 7:137. Confers with former Cong. Joshua R. Giddings (Ohio), consul general to British North American Provinces, who wants Maj. Grotius R. Giddings, his son, made brigadier general. Abraham Lincoln to Edwin M. Stanton and Henry W. Halleck, 19 January 1864, CW, 7:137-38. Cabinet discusses admission of cotton into Union lines. Welles, Diary. Thursday, January 19, 1865.Washington, DC. President Lincoln writes to Lieut.-General Ulysses S. Grant regarding Robert Lincoln, the President's oldest son, who "wishes to see something of the war before it ends." Lincoln instructs Grant to respond with his honest opinion and without regard to Lincoln's position as President. Lincoln directs Grant to reserve "commission[s]" for more deserving candidates, and asks if Robert "could . . . without embarrassment to you, or detriment to the service," obtain "some nominal rank, I, and not the public, furnishing his necessary means?" Abraham Lincoln to Ulysses S. Grant, 19 January 1865, CW, 8:223-24. Interviews Col. John Coburn regarding exchange of prisoners. Abraham Lincoln to Ethan A. Hitchcock, 19 January 1865, CW, 8:224. At 11:30 A.M. receives Baron Nicholas G. de Wetterstedt, minister plenipotentiary from Sweden. Seward to Lincoln, 18 January 1865, Abraham Lincoln Papers, Library of Congress, Washington, DC. Committee from Maryland Legislature asks President to remove H. W. Hoffman and appoint Sen. Hicks (Md.) to place. Frazier to Lincoln, 23 January 1865, Abraham Lincoln Papers, Library of Congress, Washington, DC. Lincoln attends ceremonies of U.S. Christian Commission in House of Representatives. LL, No. 450. Directs Sec. Stanton to consider investigating appeals "made to us by persons claiming to have attempted to come through our lines with their effects to take the benefit of the Amnesty proclamation." Abraham Lincoln to Edwin M. Stanton, 19 January 1865, CW, 8:225. Notifies Sec. Usher that he will appoint Vital Jarrot of Illinois, Indian Agent of Sioux on the Platte, if there is no objection. Abraham Lincoln to John P. Usher, 19 January 1865, CW, 8:225-26. Lincoln writes to Major General Edward O. C. Ord regarding Frank Judd, who currently assumes an alias. Judd is the son of Norman B. Judd, who managed Lincoln's 1860 presidential campaign and who now serves as Minister to Prussia. Lincoln explains, "You have a man in arrest for desertion passing by the name of Stanley—William Stanley I think—but whose real name is different. He is the son of so close a friend of mine that I must not let him be executed. Please let me know what is his present and prospective condition." Abraham Lincoln to Benjamin F. Butler, 29 December 1864, CW, 8:189-190; Abraham Lincoln to Edward O. C. Ord, 19 January 1865, CW, 8:224.